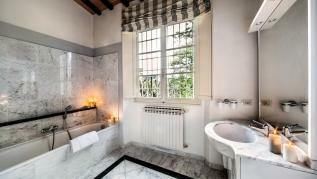 Villa Fiorentina, part of a larger estate, is situated atop the hill looking across the stunning Florentine countryside. 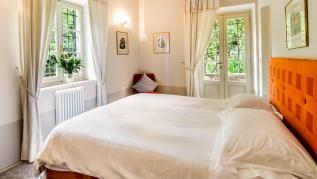 This elegant villa, recently renovated, is surrounded by olive groves, cypress trees, and beautifully manicured gardens where a private swimming pool sparkles in the sun. 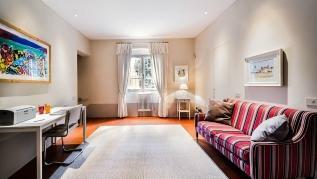 Only 5 minutes by car to the walls of historical Florence, Villa Fiorentina makes you enjoy exquisite calm while very close to the famous city. Master queen bedroom (180cm) with walk-in closet, ensuite bathroom with tub and shower stall. 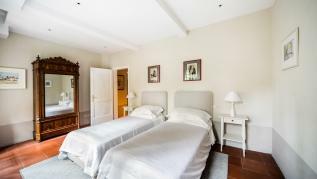 Two queen bedrooms, each with private bathroom with shower. King/twin bedroom with ensuite bathroom with shower. Queen bedroom (170cm) with ensuite bathroom with shower. 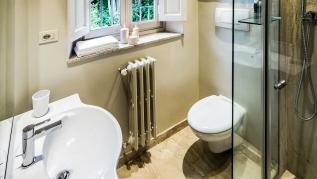 Ground Floor: The villa has been fully remodeled and carefully restyled to create an elegant and comfortable ambiance. 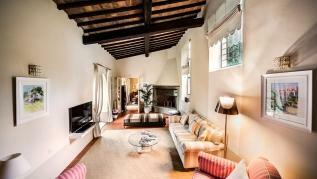 The modern bright interiors retain the Tuscan characteristics of cotto floors and beamed ceilings. The living room with large 48” satellite TV and fireplace opens onto the garden and is adjacent to the formal dining room. A office room and a fully equipped modern kitchen complete this floor. Separate laundry room with washer and dryer. Private terrace with shaded dining area for meals al fresco. Private swimming pool with sunbeds and tables sheltered by mature trees. Covered loggia with sitting area, perfect for enjoying a chilled drink. 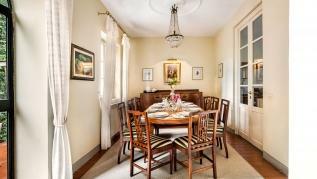 This elegant villa offers a superb location that is only 5 minutes away by car or bus from the historical center of Florence. 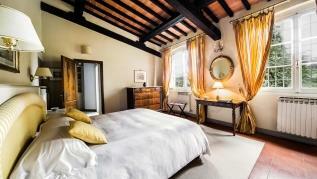 It is very rare to find a villa with such standards in the area, that’s why Villa Fiorentina rents out so quickly. If you have the chance to find it available, do not wait…Dolce vita guaranteed! Our “home” in Florence. 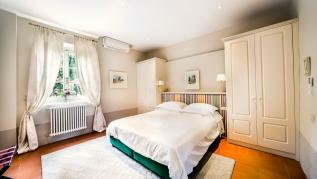 We spent a week in La Fiorentina, it was the perfect size for our party of 3 couples. 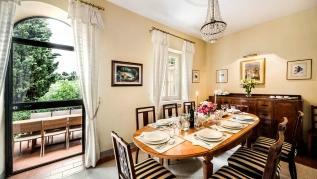 The villa was charming and spacious, nice deck with retractable awning, easy quick taxi rode to center of Florence. 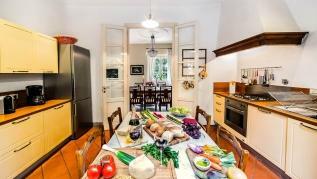 Concierge was able to stock our villa with ample provisions in advance; arrange our rental cars; and arrange a personal chef to provide an unforgettable meal, cooked in our villa kitchen and served in our dining room. The on-site contacts were very valuable and helpful.